At Thrillist, we know success takes a lot of different forms. Whether that’s achieving a personal goal, or turning a passion into paying the rent, everyone has obstacles to overcome. That’s why we’ve partnered with Sam Adams to create “The Driven.” Featuring men and women from all over the US who are a part of Sam Adams’ Brewing the American Dream program, we’re telling the stories of business owners who knew what they wanted and did everything they could to achieve it. These are their journeys. To learn more about Brewing the American Dream, click here. After Catherine Stiles and her husband Shane opened their first Austin barbecue joint, Stiles Switch BBQ, the creative mom of two saw an opportunity to create something not already done to death in the world of Texas barbecue. 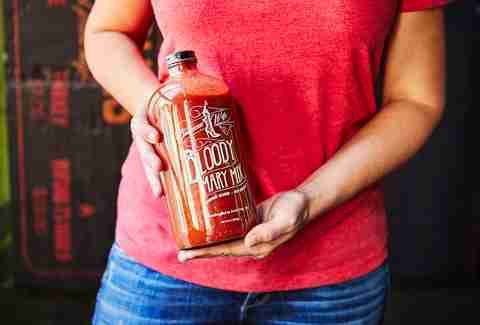 She wanted to take her family’s signature sauce and put it behind the bar, effectively turning the Central Texas flavor the Stiles team is known for and melding it with her bloody mary mix, a formula she’s been concocting for fun since college. At first sip, a Texas-sized light bulb went off. Born from the spirit of craft-style barbecue and the family-owned business Catherine and her husband have lovingly built together, Barbecue Wife’s “junk-free,” gluten-free, vegetarian cocktail mixes found a thirsty audience quickly, leading to placement in over 300 retailers across the state. In fact, the blood mary mix was so well-received that Catherine later launched a margarita mix with smoked honey, following the same clean-ingredient philosophy. But just like a tender bite of Central Texas barbecue, Barbecue Wife’s transformation from kitchen mix to premium craft product was slow, bold, and all about the details. While studying at Texas A&M, Catherine tended bar to make ends meet and pay for school. She had no idea that this skillset, paired with a decade of experience in PR and marketing at a major media brand and a health food startup respectively, would lead her down a path of creating award-winning cocktail mixers. This insight into relying on only natural ingredients remained with Catherine after she shifted gears to managing marketing and PR for the family barbecue business in 2011. It was here at Stiles Switch BBQ where she learned the time and care that goes into creating an authentic, homegrown recipe from scratch. It’s also where she got the idea to pair her bloody mix with the restaurant's signature barbecue sauce. Just about every product in the grocery aisle is trying to jump on the health food bandwagon by labeling what’s inside their products -- and what isn’t. So when Catherine kept finding bloody mary mixes, and margarita mixes, loaded up with additives like MSG, High Fructose Corn Syrup, and other “junk” on the back of labels, Catherine knew people also deserved to make a margarita they could reach for on a sweltering Texas day that tasted good and felt good to drink. Thus, the Barbecue Wife Margarita Mix was born. With local honey smoked for up to 48 hours on the barbecue pit at Stiles Switch, fresh-squeezed limes, and filtered Texas Spring water, Barbecue Wife is doing the official drink of Austin the right way. With a tiny but mighty team of five women in the kitchen, Catherine’s scaling up and fulfilling large orders every month. 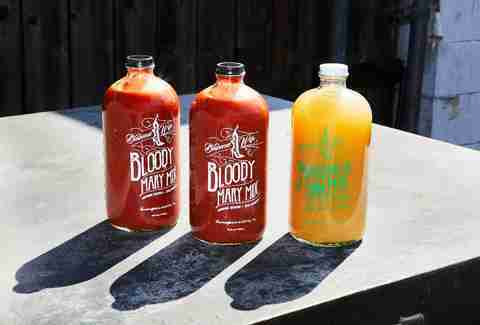 Even though Barbecue Wife is only carried in retail stores located in Texas, any margarita or bloody lover can get bottles shipped across the country online. It’s given Catherine the national attention she’s worked so hard for. Now, both the bloody mary and margarita mix are about to enter the shelves at HEB -- one of Texas’ largest retail grocery stores. This year, she took home the grand prize at Sam Adams’ Brewing The American Dream pitch contest at SXSW. All thanks to a passionate, two-minute pitch about Barbecue Wife to a panel of judges, Catherine walked away with a media package from Foursquare, business mentoring straight from Sam Adams execs -- and $15,000 that helped expand her margarita mix product line. Catherine’s become one of the first to take the flavors of Central Texas barbecue and create premium, craft mixes out of it. 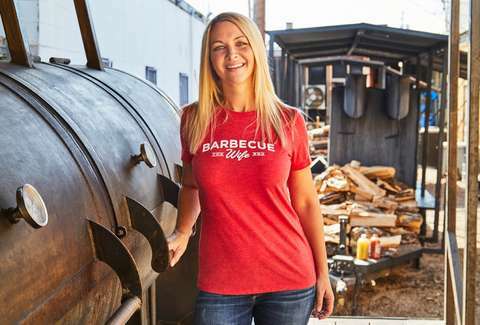 Now, she’s evolved Barbecue Wife into a lifestyle brand -- every bit of it celebrating badass Texas women living and breathing the same barbecue lifestyle that inspired her in the first place. From artist-drawn illustrations of the Barbecue Wife inside each bottle to t-shirts, koozies, and snapbacks, Barbecue Wife authentically reflects Catherine’s everyday life as a woman in barbecue. She even started a website profile series showcasing the lives of other barbecue wives all over Texas -- like Stacey Franklin of Austin’s famous Franklin Barbecue -- with Q+A’s discussing not only barbecue, but wisdom on entrepreneurship, raising a family, and striking out on your own. By using homegrown ingredients, employing local women, and showcasing other female powerhouses in barbecue, every bottle of Barbecue Wife is Catherine’s “love letter” to her hometown. From the bottle design to what’s actually inside, every savory bit of Barbecue Wife celebrates Austin and Catherine’s heritage. As thanks, she gives back to this same tight-knit community who believed in her Texas-sized idea since the beginning through a program called the “Drink Good, Do Good” campaign. Barbecue Wife donates 1% of annual net profits to local charitable causes every year, including children’s charities like Safe Austin. Giving some good back to the world -- through her very own “good time in a bottle” -- is the Barbecue Wife way of life.